Discussion in 'Falcon Crest' started by Angela Channing, Jan 12, 2018. Season 2 of Falcon Crest in one episode (Choices) Tony Cumson was played by Robert Loggia instead of John Saxon. The actors were completely different physically and in there screen presence so it was a curious recasting. That said, I thought Robert Loggia was more convincing as the weak man that Angela forced to leave Falcon Crest and also as the kind of man that would work with Richard to get Julia to sell her interest in Falcon Crest. John Saxon just seemed too nice and not the kind of person that Lance would hate so strongly. The way the character of Tony developed in later seasons when he had less of an edge and was a more sympathetic character suited John Saxon better. Which version of Tony Cumson did you prefer? John Saxon’s version because he tried his level best with the material given, to be a worthy opponent to the battle axe Angela. He also had good chemistry with Abby Dalton. They both raise their champagne. The two new brandy producers have another drink, as they look across ‘Keys Creek’. 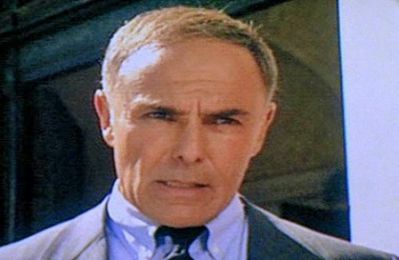 John Saxon as Tony just could not be happy with Julia because of mum in law, Angela. Although they did look excellent together and of course he was the only man to make Julia feel good. I preferred John in the role. I agree with this, he looked more like the hustler type than Tony II, so Robert Loggia was good for that part. But Lance didn't get his looks from his mother, so Tony II was more convincing, physically. These kinds of recasts are tricky. I tend to agree with everybody's points here... If they needed to revisit the Tony Cumson backstory in Season 2, maybe Loggia should have been brought in as Tony's brother or somethin'. No matter how many TV shows and movies Saxon has done, I can't help but conjure his STARSKY & HUTCH role as a ballet instructing vampire named "Nadasi" (that's "I Satan" spelled backwards sorta). And anyone who can look that angular and creepy can also appear on FC/DARK SHADOWS, etc., which I guess is why FC brought him back. I find him a wee bit less convincing as a sheik on DYNASTY, that Rashid Ahmed whose surname they always mispronounce. Rasheed, yes...but what's the alternative? Rashit? But I think he should have been played by Omar Shariff (Dynasty needed more Classic Hollywood anyway). Oh well, at least it didn't look as silly as Prince Abdullah from "Lace". Definitely John and he should have become a permanent cast member, to fill the gap when Robert Foxworth was written off in 1987.